BEFORE an appliance repairman steps foot in your house, these are the 4 most important questions to ask an appliance repairman. You should ask them these important questions regarding their business such as how long they’ve been in business or been repairing appliances, if they have any references, warranties, and if they will provide an estimate before any working is completed or parts ordered. After all, home appliances such as washing machines, dryers, refrigerators and ovens are some of the most valuable and costly items in your home. When these appliances are down, this can be one of the most frustrating experiences anyone can encounter. Because these appliances are expensive, the decision on whether or not to replace or repair them can be a difficult one. While, it is possible to fix these appliances on your own, it’s not advised that you do so because there is a lot of technology associated with these appliances nowadays. Therefore, the most viable option is to call an appliance repair company. Here are the four most important questions to ask your appliance repairman before making the decision to hire one. How long has the company been in business? The longer the company has been in existence, usually the better they are at doing their job. This is an industry where good service leads to longevity because news of a reliable appliance repairman spreads through word of mouth, which leads to more relationships for the company and more business. You should also ask how experienced and qualified the technicians employed by the company, because these are the people who will be working on your appliances. Are there any references? This is another important question to ask an appliance repairman. A reputable appliance repairman should have a long list of references because that is the nature of this type of business. People love giving good reviews when they have experienced good service especially on items, which are valuable to them. If the company you are speaking with cannot supply you with a viable list of their customers, this is a red flag and a sign that the company is not reliable and shouldn’t be hired to work on your appliances. Do you get a warranty? An appliance repair company that offers a substantial warranty to their customers is a sign of good service because this shows that they are willing to back up their work. It also shows that they have confidence in their staff. What are the costs involved? The cost of repairs can be broken down into two categories, cost of the parts being replaced and the cost of the labor to fix the appliance. It is your responsibility to get an estimate from the repairman before letting them fix your home appliance. You must also know that getting the cheapest service is not always the best option because, usually the cheapest cost for service comes with the company taking many shortcuts to reduce their cost. These are four of the most important questions to ask an appliance repairman BEFORE they do any work. These are also the same reasons why you should hire Area Appliance Services (AAS) to handle your home appliance repairs. We’re a family owned and operated appliance repair company and have been in existence for over 50 years. We offer a great 12-month warranty on our labor and parts, plus we have great reviews from our customers. Give us a call at (847) 459-8070 today and schedule an appointment with us. 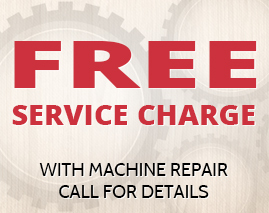 For a limited time we are offering a free service charge with machine repair.